Daytona Beach, FL WW/Press/December 29, 2015 –Erum S. Kistemaker, Attorney at Kistemaker Business Law Group, was selected for inclusion in the forthcoming Top Attorneys of North America 2015-16 edition of The Who’s Who Directories. The accomplishments attained by Mrs. Erum Kistemaker in the field of Legal Services warrants inclusion into the Top Attorneys of North America. Erum Siddiqui Kistemaker has a diverse and unique legal background. She is licensed to practice law in multiple jurisdictions, states, and countries, and has worked in a variety of legal settings around the world. Erum has worked for some of the largest, leading and most respected international, national, and local law firms; government agencies, and as in-house counsel. She is licensed to practice in Florida, New York, England, and Wales, and previously worked as a Solicitor for one of United Kingdom’s largest international law firms, Wragge & Co., practicing in the areas of international corporate litigation and property law. Much of Erum’s litigation experience, skill, and knowledge was gained as an Assistant State Attorney, having the privilege to litigate over ten jury trials. However, she began her passion for business, real property, development/construction, and Condominium and Homeowners Association Law while working as an associate for Carlton Fields, one of the nation’s largest and leading law firms. Mrs. Kistemaker received her J.D. from the University of Miami School of Law and is a member of The Dunn-Blount American Inn of Court, United Way of Volusia and Flagler Counties Board of Directors, and has received the AV rating Distinction. 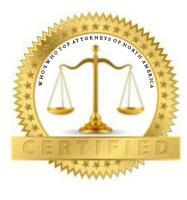 Be the first to comment on "Top Attorney – Erum Kistemaker"